The Villagers Inn is a locally owned and operated hotel, restaurant, liquor store and pub. The hotel offers comfortable and affordable accommodation, the restaurant has excellent fresh food and the pub has a relaxing atmosphere where you can enjoy some time with your friends. Spacious and modern rooms are offered with queen beds, air-conditioning, complimentary coffee, direct dial phones and high speed internet. Large parking area. Pet friendly. A lunch and dinner menu is offered. The restaurant serves Western dishes and Chinese food. Watch a sports game on the big screen TV, play a game of pool or just kick back and enjoy a drink & a daily food special. You'll discover good food, friendly service and scheduled live entertainment. The liquor store is stocked with a selection of beers, wines and spirits with a focus on BC wines and liquors. Open everyday noon to 11pm. The close-knit community of Fruitvale, and close by city of Trail, are flanked by the Monashee Mountains to the west and the Selkirk Mountains to the east. A visit to this area should certainly include a tour of the Trail Museum, the Sports Hall of Memories and the Teck Trail Operations Interpretive Centre. For great views, live music, picnic sites and a fine beach to cool off, head to Gyro Park after your day of exploring. 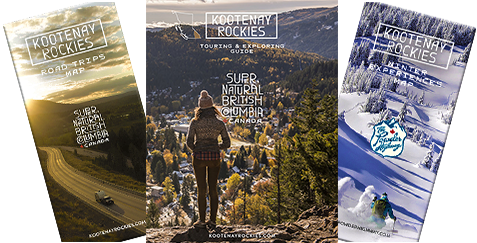 Visit the Kootenays and stay with the Villagers Inn. Front desk and convenient liquor boutique.